This was General Palmer's daughter's room - the best room in the house. The window on the left leads out to a solarium. Well... when are you visiting? They gave good bed and breakfast rates! And, how about that for a shower! 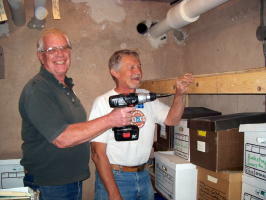 The first picture is of Sam and Ed making shelves for documents in the basement of the castle. 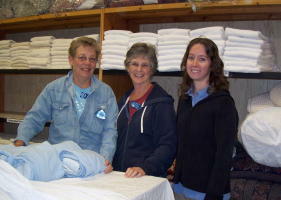 Then Patty with a couple of ladies working in the linen department. And we had cake! 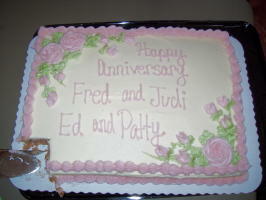 We had our anniversary on the 11th, and Fred and Judi on the 12th. 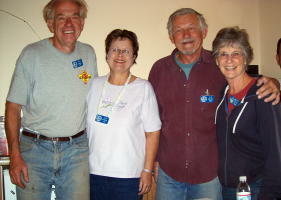 This is how we started near the top overlooking Colorado Springs. It soon settles into a relatively quiet dirt road.